Honor has recently launched the Honor 5C with their own Kiri 650 chipset. In case you missed out, check out the Honor 5C review and the phone is going to be available via Flash sale in India. In this post, I am going to mention some Honor 5C tips and tricks which I found out to be useful while using the device for a long time. Most of these tips and tricks also applicable for other Honor devices like Honor 5X, Honor 4C, Honor Holly Plus and other Marshmallow running Smartphones. So without any further delay lets get started with the hidden Honor 5C Tips and tricks. The Honor 5C comes with the Fingerprint scanner and luckily you can lock the Apps installed on your phone with the Fingerprint Scanner. Many Smartphone with the Fingerprint Scanner does not allow you to lock and unlock Apps with the scanner. But in the Honor 5C you can Lock and unlock the specific App by heading to Phone manager>Swipe right and choose App Lock option. 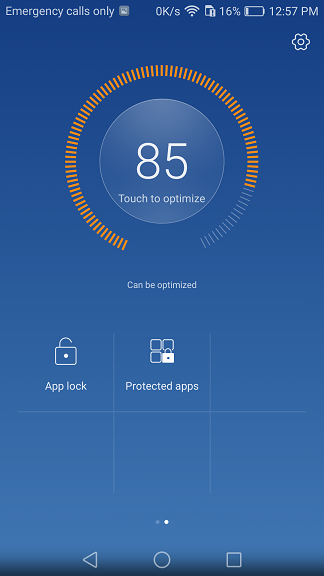 Here you can choose the Apps or games you want to lock with the Fingerprint Scanner. You can make a lot out of the Fingerprint scanner on the Honor 5C apart from Unlocking the device. You can take photos/selfies, Answer call, Stop alarm using the FP scanner. 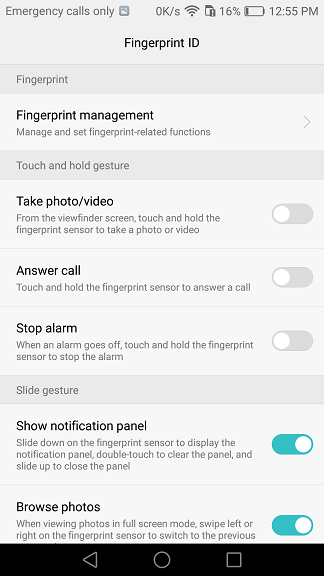 Additionally, you can also access the notification panel, swipe left and right the images in the gallery easily with the Fingerprint Scanner. To do it, go to settings> Fingerprint ID> and enable the features you want. You can see the remaining battery percentage on the Honor device without any third party Apps. To enable it, go to settings> Battery and tick the battery percentage option. You can also change the style of the battery percentage appearance. It will be shown inside the battery icon or next to the battery icon. To change it go to Settings> Notification Panel & Status bar > Battery Percentage. Notification light on the top of the Honor 5C alerts you when the new notification arrives. It is very useful when you want to check if any messages or calls arrived without even unlocking the device. You can enable the Notification light, go to Settings> Display> Indicator light. The speed of your mobile internet or the Wifi connection will be displayed in, the status bar without any third party Apps. How cool is that? yes, you can enable and display the network speed on the top of the display by going to Settings> notification Panel & Status Bar> Display Network Speed. Traveling in the bus by holding the support rod at the top and still want to use the Smartphone? Using the bigger smartphone with one hand while traveling or doing some work is really a challenging job. But now it is made easy with the One hand mode on the Android platform. On Honor 5C or another Honor devices you can enable it by going to Settings> Accessability> Mini Screen view. Once the option is enabled you can get the mini screen swiping the on-screen button from left to right as shown in the image. The background running Apps can be viewed by tapping the menu onscreen button. you can easily close all the Apps by tapping the trash icon at the button. You don’t want to close any specific App then you can lock that specific up by swiping down and later you can close it by swiping up. You can track and manage the mobile data or the Wifi data. You can see how much data have been used from your network data or Wifi and also track the data Consumed by the specific Apps. You can track these details by going to Settings> Data Traffic Management. Bored of using the same font and want the fresh look. You can change the Font size and the font style by heading to the Settings> Display and choose the Font size and style of your wish. Honor 5C comes with the tracking sensor inbuilt which usually comes with the fitness or tracking band. You can track the number of steps you have taken or even keep an eye on the total number of calories you have taken or burned. You can view these details by opening the Health App on your phone. So guys, these are the some of the unknown or hidden tips and tricks of the Honor 5C. As said earlier some of these tricks may also work on the other Honor devices like Honor 5X, Honor 4X, Honor Holly 2 Plus or some other Marshmallow device. In case if I have missed out any of the tricks you can mention it below which would help out our readers. For more such posts, follow us on Facebook, Twitter, and Instagram.